The Arabic verb wajada means: to find sufficiency in one’s means and be well off, and it may also mean to find, meet and know. The definition of the name of Allah, AL-WAJID, the Great FINDER, denotes that its opposite is (the loser). Allah ordinates, finds and has every thing, all things are at His Beck and Call. 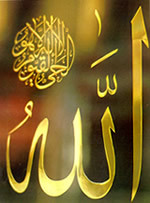 The name, AL-WAJID, is not mentioned in the Qur’an, yet it is agreed upon. If someone loses what he does not need then he will not be a loser, similarly the one who has what he does not need is not a finder, as the finder is he who does not lack what he needs for his existence. Thereupon, Allah is the Great FINDER as He never misses anything He needs either in His Self, His Existence, or His Epithets of perfection. He is the Self-Sufficient Who dispenses with everything; from Him all attributes of perfection are derived, and to Him all the attributes of Exaltation are attributed. He is the Great FINDER, Praise and Glory be to Him, He is Allah.